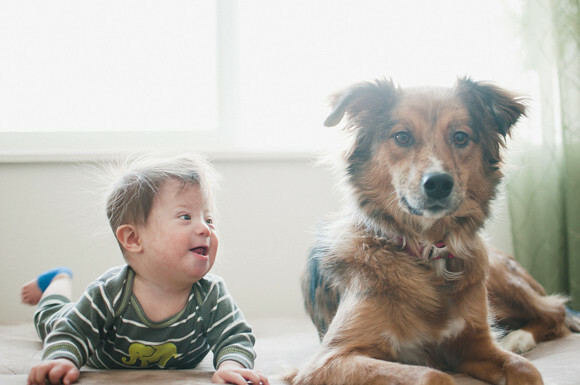 A boy and his dog…again. Taking pictures of them interacting never gets old. Layla loves him and takes care of him as if he’s her own, and he loves to sit on my lap and pet her. I can’t say enough how happy I am to see them being best friends. Auggie’s smiles and giggles are becoming more frequent and he already has quite the personality, if it’s not obvious enough. If you’re wondering what the bright blue thing on his foot is, it’s his bandage from getting some blood work done earlier that day. 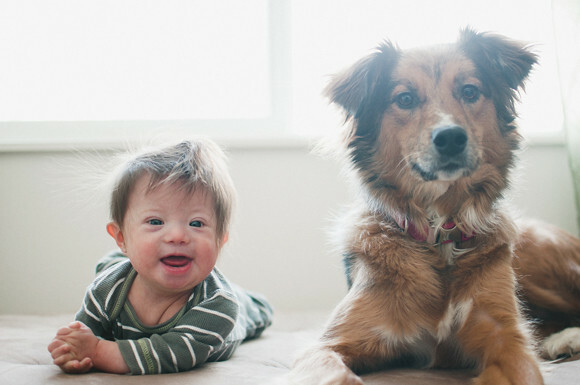 It’s required for a baby with Down Syndrome at the age of 6 months to get a CBC test to check for Leukemia, and as he also has Hypothyroidism, his thyroid levels were also needing to be checked. Needless to say, it was a pretty nerve-wracking afternoon, until we received the call that his test results came back and everything looked GREAT. Our little boy is healthy and his thyroid levels are perfect! He seemed pretty happy about it too, as shown in the pictures. Having a baby with DS comes with it’s challenges and fears, but I wouldn’t trade him for the world. I can’t believe how blessed we are to be his parents, even 6 months later it still feels surreal that we have such an amazing little boy. And I don’t think that feeling will ever go away. Gentri - These two are so adorable. Dogs are amazing, i love that she just cares for him so much!! Larissa - Hahaha these are the best! That big one right in the middle is a framer, for sure! Mia - He is so precious. 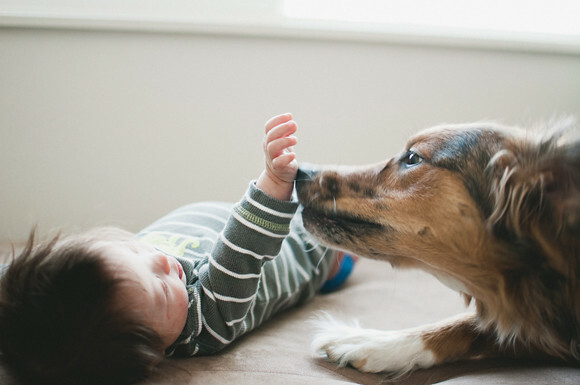 The pictures are so sweet with your little guy and dog. jensen - Your photos of Auggie are always the most adorable and full of so much joy! Britt gave this talk a few weeks before losing his little girl to cancer, but his vulnerability and faith and honesty are so heart-warming. Thought it could bring some more beacons of hope to those moments filled with struggle and fear in your journey with Auggie. kumagirl - my gosh you have the most adorably photogenic son! Glad to hear he’s a healthy boy! Daphne Mitra - You have a beautiful baby and the photos with the family dog are amazing 🙂 Indeed, he is a blessing and it seems that you have the right attitude towards the whole thing — an acceptance that is inspiring. You are indeed blessed. Adele - Lol he is just the cutest thing on earth! Lacey - what a blessing, he is absolutely precious! Victoria / Justice Pirate - So happy to hear that everything is going so well for him! I wish I could hear his cute giggles while looking at the photos! He is so sweet! Valéria Paim - O Auggie é realmente surpreendente ! Parabéns pelo seu belo bebe. Emma n. - He really is perfect.